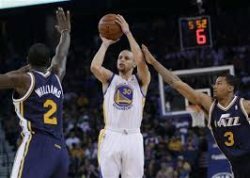 SAN FRANCISCO -- The Golden State Warriors nailed 17 triples and scored 130 points, both season highs, to beat the Utah Jazz 130-102 Sunday night at the Oracle Arena in downtown Oakland. The Splash Brothers -- Stephen Curry and Kyle Thompson -- proved too hot to handle for the visiting Jazz, whose disappointing season plummeted further down to 24-53. The guard duo combined for 64 points on 23 of 38 shooting from the field. They also made 12 of 20 threes with Curry producing 16 of Golden State's 34 assists. "Those guys are special, they set the tone. Tonight, they got great looks and they made the opposition pay," an obviously please Warriors head coach Mark Jackson told NBA.com at the post -game press conference. Andre Iguodala and Draymond Green each had 11 for Golden State. Center Andrew Bogut was held to six points but he pulled down 11 rebounds as the Warriors improved to 49-28 and keep their sixth place spot in the Western Conference standings. Rookie Trey Burke had 24 points and 15 assists in Utah's losing cause. Photo: Steph Curry exploded for 33 points and the Warriors easily handled the Jazz Sunday night at the Oracle Arena.